Raumfahrt+Astronomie-Blog von CENAP - Blog: Raumfahrt - Sowjet-Ära Kosmonaut Anatoly Berezovoy (Raumstation Saljut) gestorben. Sep. 20, 2014 - Soviet-era cosmonaut Anatoly Berezovoy, who led the first expedition on board Russia's final Salyut space station, died Saturday (Sept. 20). He was 72. 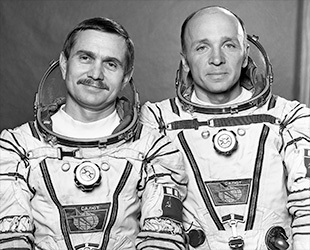 "[Berezovoy] was a member of a legendary generation of cosmonauts, a man of great will and courage, [and] a top-class professional who did so much for the development of cosmonautics and major research projects," said Oleg Ostapenko, the chief of the Russian federal space agency Roscosmos. "His memory will live on forever in the hearts of those who knew and loved [him]." Chosen to be a cosmonaut in April 1970, Berezovoy made his first and only spaceflight 12 years later as commander of the Soyuz T-5 mission to the Salyut 7 space station. Launched on May 13, 1982, Berezovoy and FLIGHTengineer Valentin Lebedev spent a then-record 211 days aboard the orbiting outpost, which was the last of its type before the launch of the Mir space station in 1986. During his expedition, which was flown under the call sign "Elbrus," Berezovoy and Lebedev operated cameras and a telescope, materials processing furnace, and plant growth chamber. The two crewmates also deployed a small radio communications satellite, which the Soviet Union claimed as the world's first satellite to be deployed from a manned spacecraft (NASA's space shuttle Columbia would launch with two communication SATELLITES on the STS-5 mission later that same year). Berezovoy and Lebedev also made a two-hour, 33-minute spacewalk on July 30, 1982, to retrieve material exposure samples and replace equipment. The two cosmonauts were visited by four robotic resupply ships and two crews. 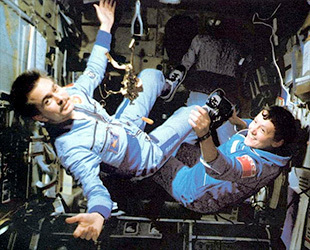 Among Berezovoy's and Lebedev's temporary crew members were the first French citizen to fly in space, Jean-Loup Chrétien, and the second woman in space, Soviet cosmonaut Svetlana Savitskaya, as well as Vladimir Dzhanibekov, Alexander Ivanchenkov, Leonid Popov and Alexander Serebrov. 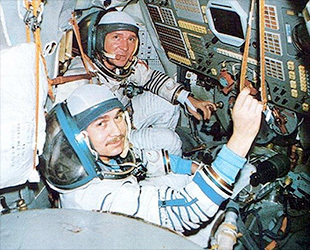 Berezovoy and Lebedev returned to Earth from the Salyut 7 space station on Dec. 10, 1972 on board the Soyuz T-7 spacecraft. Touching down in heavy snow and on uneven land, which caused their capsule to roll down a slope, the two cosmonauts — already weak from being in space for so long — spent the night with recovery personnel, waiting for a helicopter to come the next day. In total, Berezovoy logged 211 days, 9 hours, 4 minutes in space. Although he served as a back-up commander for several other Soyuz FLIGHTS, Berezovoy did not fly again. He retired from the cosmonaut corps in October 1992 after suffering injuries in an armed robbery. Anatoly Nikolayevich Berezovoy was born April 11, 1942, to a Ukrainian family in the Russian village of Enem. He attended the A.F. Masnikovin military flying school, where he graduated in 1965. During his time on Salyut 7, Berezovoy penned a 92-page diary, in which he RECORDED his space experiences for his wife, Lidia Grigorievna, and their two children, Sergei and Tatiana (then 13 and 8 years old, respectively). "For a long time I've been trying to write about everything that has moved me during these days passed in FLIGHT," Berezovoy wrote to begin the journal on June 22, 1982, a month into his 7-month stay, according to spacediary.info, which has offered the original hand-written diary for sale. "There is a lot of work to be done." After leaving the cosmonaut corps, Berezovoy served as vice president of the Cosmonautics Federation of Russia from 1992 to 1999. In 1995, he campaigned for a seat in Russia's parliament representing the Republic of Adygea, but lost in the election. Berezovoy was honored as a Hero of the Soviet Union and bestowed the Order of Lenin for his service to his country as a cosmonaut.